St. Francis of Assisi has a powerful hold over the hearts of many Catholics, non-Catholics, and even non-Christians. The ‘Poverello’ of Assisi, whose death occurred over eight centuries ago, lives on in his spiritual children and all those who have come to understand the importance of his all-embracing ministry. God offers us extraordinary signs to remind us that God is with us. The miracles that suspend or enhance the laws of nature are only messages reminding us that what seems permanent is only passing. The famous ‘bookmark’ of Saint Teresa of Avila states: Let nothing disturb you. Let nothing frighten you. All things are passing. God alone remains. Who possesses God possesses all things. Holiness is being possessed by God. If we seek only the extraordinary, we may fail to recognize the wonderful gifts found in the ‘ordinary’ experiences of life. God is always at work fulfilling His will in both the ordinary and the extraordinary. Focusing on ‘the wonder of the miraculous’ in the life of any holy person, we may lose sight of the ever-present gifts of grace in him/her, that we too share with the saint according to our cooperation with God’s grace. The gift of grace we receive at Baptism awaits to be developed in our own unique way so that our lives be God-centered, following Jesus and the Gospel. Simply stated: we are called to be “holy”! Holiness is not a static quality; it is exciting and ‘ever-new’, to paraphrase Saint Augustine, O (Holiness), ever ancient, ever new, late have I loved You. True holiness is a reflection of the One Source of all Life, Whose Love is eternal, and Who is always at work in creation. Like the moon, a ‘holy’ person reflects the light of the Son of God, Jesus, in Whose Name we live, and move, and have our being (Acts 18:28). Holiness reflects the goodness of God in our human nature. St. Francis’ Canticle of the Creatures is a reminder of how he was able to see the attributes of God reflected in all creation. Though we are weak and infinitely less perfect than God, grace urges us to be active agents of God to others. As the adage goes, saints, like the prophets of old, are called into service for others in the name of God, in order to give comfort to the troubled and to trouble the comfortable. They are women and men who have turned their lives over to the Lord, and who must confidently struggle like all human beings to fulfill the purpose for their existence. Scripture tells us that this purpose is: Be holy because I your God am holy (Leviticus 19:2) … Be perfect as your Heavenly Father is perfect (Matthew 5:48). The Spirit Jesus gave as the Gift of Easter to His Church is the same Holy Spirit we receive at Baptism and Who strengthens us at Confirmation. The Holy Spirit with the Father and the Son is the ‘God within’ (In Greek the words are ‘en-theos’ from which we get the word ‘enthusiasm’) encouraging us to be excited about life and our role in fulfilling God’s eternal plan for all creation. ‘Holy’ people are not secluded from the world. They live aware of their responsibility ‘to be Jesus’, to assume the image of Christ to others. Secular Franciscans live in the world, but not of it, so they can be the yeast in the dough, the salt in the food. Like yeast and salt they must be as though lost or dissolved that they might truly affect a change in others as they allow themselves to be spent for the Lord’s greater glory. Like Jesus, they too must endure the consequences of rejection, as well as the joys of acceptance. Do not be afraid! What we lose is ‘extra baggage’ we have allowed to clutter our lives, and what or better to say ‘Who’ is gained is the Jesus we become more and more. 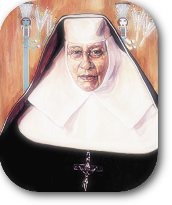 During this Jubilee Year of the 40th Anniversary of the OFS Rule, the sisters and brothers of the Secular Franciscan Order would do well to reflect more deeply on the Rule and Constitutions. The Rule does not impose but offers opportunities to live more deeply the spirit of St. Francis of Assisi as he sought to live the Gospel. You form an integral part of a family that has cheerfully disarmed its heart and actions so that others might experience the love and mercy of Jesus as lived by the spiritual children of the Poverello. The various words taken from Hebrew and Greek originally used to express the word ‘holy’ actually indicate a ‘separate-ness’, an ‘other-liness’, an ‘un-earthliness’. The world and our lives seen from that perspective make the challenge more interesting. Holiness is not a question just of not doing bad things. It is a life grounded in the reality of the world of which we are intimately a part by nature, but lived in a way that allows the ‘super-nature’ to be the root and goal of every moment. It takes a lifetime to fulfill and that’s what makes it interesting and exciting. Every moment, till the end of our earthly journey, is an act of faith in God, of trust in His providence for the future, and of love for the One Who journeys with us through time to eternity. Isn’t this what our Seraphic Father taught all his children by his total trust in Divine Providence? Two ‘gifts’ accompany our journey and enhance and feed our desire to be holy: the Eucharist, source of holiness, and our brothers and sisters given by God to us as ‘gift’ (cfr. Testament). The Eucharist is the constant pledge and strength of the One Who said: I am with you always (Matthew 28: 20). It is the Eucharist that gives meaning and purpose to all we do, since in this wonderful Sacrament we are one with the Lord in everything, and are strengthened in our bond of charity with each other and all creation. The more we strive to ‘do holy things’ in order to ‘be holy’ the more we realize we do not always achieve what we proposed; it only reminds us that what matters is what God disposed for us in life. Father … not my will but Yours be done (Luke 22:42). Holiness is a question of seeing all things in the light of God’s Eternal Will. We must be able to say with Jesus: It is accomplished (John 19: 30); or with Saint Paul: I have competed well; I have finished the race; I have kept the faith. From now on the crown of righteousness awaits me, which the Lord, the just judge, will award to me, and not only to me, but to all who have longed for his appearance. (2 Timothy 4: 7-8). Goodness surrounds us in many ways. Often we fail to recognize the depth of it because it is so ‘normal’. Holiness takes on many faces. Character, circumstance, challenges, and the like, influence how holiness is perceived and/or expressed. Much has to do with how holiness is portrayed and perceived. There are varied ways in which sanctity is portrayed, presented ad even promoted in this world. The image is so often distorted, exaggerated, and sometimes even rendered ridiculous because of fanaticism and misguided ‘religiosity’. The Orders and Congregations in the Church all have their Rules and Constitutions, and Statutes and Regulations. These are spiritual and/or bureaucratic documents that strive to keep everyone focused on how that religious family seeks to grow in holiness for God, Church, humanity and obviously for the person who has professed that particular life. Self-styled saints make it difficult for anyone to live with them, since they see themselves as the ‘code of holiness’. Holiness without humility is just pride with a mask! There are good people who struggle each day to live God’s will. They pray and desire that others do the same. They forget that holiness like love depends greatly on the will. A fruit of love, holiness is an ongoing act of the will that strives to cooperate with God’s will at every moment. No one can be forced to be ‘holy’ but anyone in proximity to many ‘well-meaning holy ones’ are often ‘bulldozed’ into one practice or another. ‘Live with a saint and become a martyr’ is an amusing and most-of-the-time-correct adage that may have its foundation in these two examples. They forget that the kingdom of God is not a matter of food and drink, but of righteousness, peace, and joy in the Holy Spirit (Romans 14:17). Then there are the ‘saints’ who strive to live in God’s will, to ‘live Jesus’ and His Gospel. These people offer others by their words and example the opportunity to understand God’s love. As they grow cooperating with grace at their own pace, they become an encouraging example for others. Nevertheless, the more they affect the lives of others by their good example, the more they often become the object of scrutiny and personal demands to ascertain their authenticity. What better vocation promotion than an authentic life: integrity leads to credibility! Secular Franciscans, Spiritual Children of St. Francis of Assisi, have ‘things’ that they ‘do’. Nevertheless, the basic objective of being a spiritual child of St. Francis of Assisi is to be a saint! We believe God has called us to this life to give God glory, save our souls, and thus become saints. This is not exaggerated or proud. All of us are called to holiness. Life and the things we do are intended to help us to fulfill this challenge. In the Poverello of Assisi we find a privileged soul who speaks to our heart. His example and words help us to see God and evaluate our response to God’s will. Like the great leader he has remained, our Seraphic Father helps us to have confidence in God and in the gifts God has given us. These ‘gifts’ are reflections of the attributes of God we share with others. No one can make us holy but God and our own free will totally available to God’s Will. As Spiritual Children of St. Francis of Assisi let us make a committed promise to the Lord each day to be holy. Let us offer each day and all it contains to the Lord. Let us recommit ourselves daily to the ‘Covenant’ the Eternal Father made with us in the Blood of Jesus that is renewed every time the Sacred Sacrifice of the Mass is offered; the gifts of the Holy Spirit will strengthen us to become the holy people we were called to be, and have sought to become through the intercession and charism of our Seraphic Father. We all have an invitation to eventually to meet in heaven. Thousands of spiritual children of Saints Francis and Clare of Assisi have gone before us and await our arrival. July 16th commemorates the canonization of Our Seraphic Father Saint Francis eight centuries ago. That day the Church officially declared Francis Bernardone of Assisi a saint to be revered as a friend of God and pattern for God’s People who seek as an example in word and lifestyle to enter a deeper relationship with God. Let us be true children of our spiritual ‘parents’, our Father Francis and Mother Clare. The holiness to which we are called is not a pious reflection but a vital call that will determine our eternal destiny. To paraphrase our Seraphic Father: There is so much good that is in store for us, that even pain and difficulty are tolerable and even pleasing. Make this Jubilee Year a time of rejoicing, reflection, renewal, and rebirth in the Seraphic Spirit of our Gospel Life. May God bless you; Our Lady guide, guard, and protect you; and our Seraphic Father St. Francis of Assisi look over each one of us, his spiritual children, with loving care.